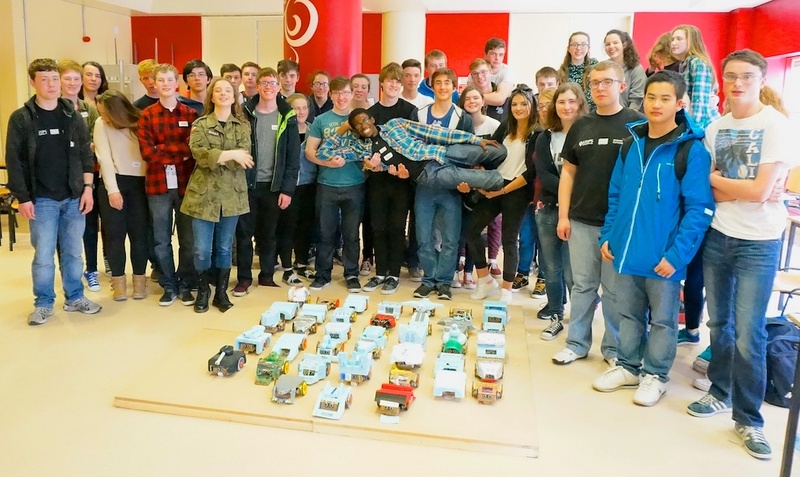 Forty-two secondary students–half girls and half boys–from the Dublin area built RoboSlam robots as part of the “Engineer Your Future” program provided by DIT. These ‘Transition Year’ students were eager to learn about electrical, electronic, and product design engineering and to explore engineering careers. The RoboSlam volunteer team was on-site four days to help the “Engineer Your Future” students and organizers and to lead robotics and electronics portions of the week-long project. The students also participated in tours and smaller projects–writing essays, building spaghetti towers, and touring a power plant, for instance. The week culminated with a RoboSumo championship, a rumble among all robots built during the week, and an awards ceremony. The engineering lecturers were highly impressed with the talent and enthusiasm of this group. We’re hoping to see these budding engineers at DIT or another of Ireland’s fabulous engineering programmes in a couple of years! The big project we had on last week….